Recorded at the Bayerischer Rundfunk, Studio 2, M�nchen on 18-20, 24 July 2002. As tradition has it, Haydn�s arrangements of Scottish folk songs began as an act of charity to help a musical acquaintance in debt. 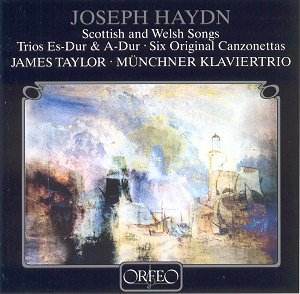 However, it seems that Papa Haydn had quite an affinity for these charming ditties beyond their altruistic possibilities: by 1804 he had arranged over four hundred folksongs of the British Isles. These are pieces that carry no pretension, and hearing them is pure joy. For some reason, the vocal music of Haydn is often neglected by professional, concertizing singers and left as pedagogical exercises for beginning students of vocal performance. This disc stands as a strong argument against this practice. The songs on this disc, both the folksong arrangements and the canzonettas, are refreshing and invigorating. The melodies are striking in their simplicity and elegance. Throughout the folksongs especially, the prosody is full of rhythmic twists and turns which, while always sounding natural, keep the listener engaged and entertained. James Taylor imbues these pieces with incredible lyricism. His voice is unquestionably gorgeous, and his clear, natural production eradicates any sort of operatic affectation. His diction is virtually flawless, and his vast palette of vocal color tells the stories vividly. The M�ncher Klaviertrio plays with him (the Scottish and Welsh songs) quite well. Balance is always far above acceptable. Koeckert weaves an incredible line around Taylor�s voice, oftentimes matching timbre spectacularly. The cello articulation is occasionally a bit harsh and too marcato, but through the vast majority of the time, Zank provides solid bass support. The Canzonettas are for piano accompaniment only, and in these, Donald Sulzen truly shines. His playing is ultra-informed by the text, and balance is never an issue. This is quite a feat when one realizes that Haydn�s writing often includes octave or unison doubling of the vocal line. The two trios included on this disc show the M�nchner Klaviertrio at its best. Playing is always sensitive: articulation is unified and interesting, and special attention is given to natural, rhetorical phrasing. Dynamics seem to be this trio�s weakness as often it seems as though everything stays between a solid mezzo-forte and double forte. It is a shame because the phrasing is otherwise so impeccable and more dynamic variation could have rounded these performances out as no less than miraculous. Tempi always seem natural and un-hurried: there is no fast playing for the sake of fast playing. This recording represents the highest level of tasteful, subtle execution. This recording is a must-have! Finding a better recording of these Haydn vocal works will be a challenge.